Turkey continues to escalate tension in the Aegean Sea. Ankara is determined to challenge Greece’s sovereignty either through official statements or through its media. 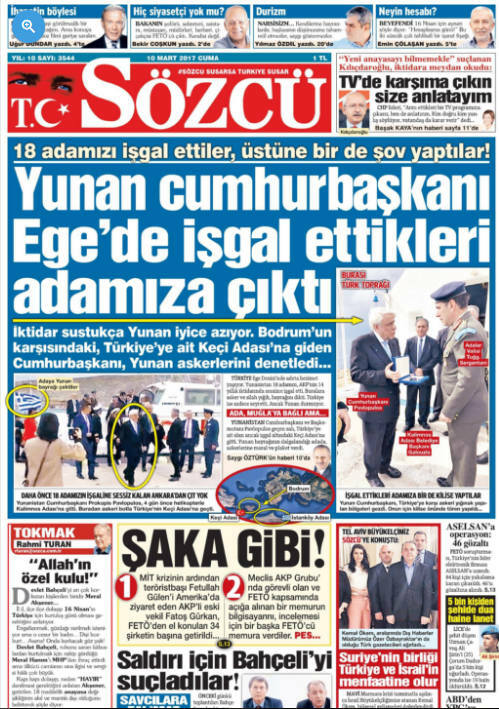 Daily newspaper Sözcü published its Friday front page claiming that Greek President Prokopis Pavlopoulos visited a …Turkish island that is occupied by Greeks. The President visited the island of Pserimos on Tuesday 7th of February to celebrate the Independence of Dodecanese part of it is the island of Pserimos. The newspaper uses the Turkish name Keci for the island of Pserimos. “The Greek President went to the occupied island. 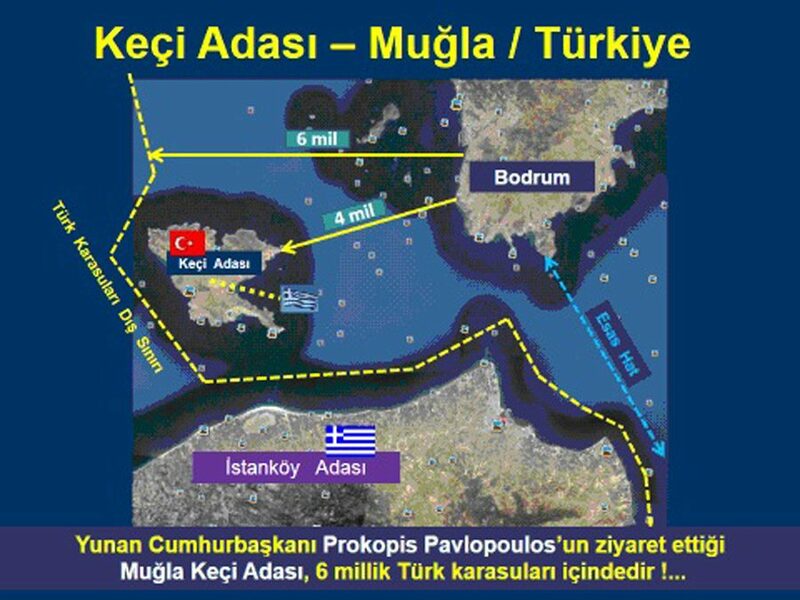 Greece has taken in the past 18 islands from us and they stage a show,” Sözcü writes and adds that Pserimos (Keci) is opposite of Bodrum and presents a map claiming that the Greeks flag on the island is illegal. The island of Pserimos (Greek: Ψέριμος Δωδεκανήσου) is a small Greek island in the Dodecanese islands chain, lying between Kalymnos and Kos opposite from the coast of Turkey. The island is part of the municipality of Kálymnos, and has a population of 80 inhabitants according to the 2011 Greek population census. The map graphically presents the Turkish claim that Turkey has a sovereign right over all islands of the Aegean Sea that are within a distance of 6 nautical miles from the Turkish coast although the Treaty of Lausanne (24 July 1923), which settled the issues of sovereignty in the region after the end of the WW I and the Greek-Turkish war (1919-1922), clearly mentions that only the islands of Imvros, Tenedos, Rabbit islands, as well as, the islands situated at less than three miles from the Asiatic coast, remain under Turkey’s sovereignty. Sözcü newspaper belongs to the Kemalist opposition that last autumn started to accuse Erdogan’s government of having handed over to Greece “16 Turkish islands.” In the daily’s front page, the number of islands has risen to 18 islands. “According to the Treaty of Lausanne, Yalım said, a total of 18 Turkish islands and 1 Turkish rock [probably ‘islet’] which are under Greek “occupation” were under the sovereignty of Turkey. The Greek President, ministers and commander-in-chief went to Presimos island and the scandal was disclosed when Greek media covered the visit. It is understood that the task of the Turkish Armed Forces was prevented,” retired colonel Yalim said. Turkish FM Cavusoglu said later on Friday that the “Aegean is a national issue” and revealed that the after the presidential referendum, the government will invite the opposition party leaders in order to draw a united stance on the issue. Ankara set out to increase tension in the Aegean Sea after Greece’s Supreme Court rejected its request to extradite 8 Turkish soldiers who fled to Greece one day after the failed coup in July 2016. The Turkish Constitutional Referendum to expand the powers of President Recep Tayyip Erdogan is scheduled for April 16th 2017. As “national causes” have always had a great impact on the Turkish electorate, tension is expected to escalate until the referendum is over. We only uploaded the turkish article and the reaction of the Greek side. The readers can see the Turkish article and the response of the Greek press.